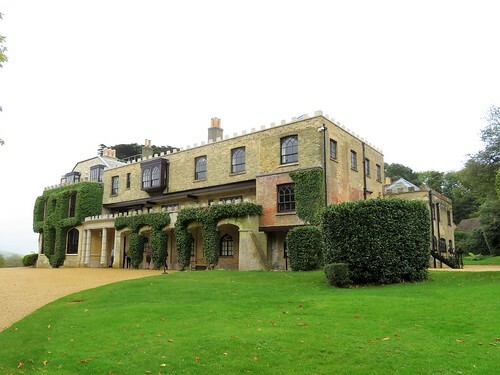 Approaching Farringford along the footpath from Tennyson Down, my first reaction was ‘What an ugly house!’ Farringford in its yellow brick bulk, all castellations and creepers, looks as forbiddingly Victorian as can be. It’s only when I was immersed in the dark red and blue rooms, the study and drawing room, the schoolroom and bedrooms where the Tennyson family led their intensely interwoven lives, that I began to appreciate what a haven this Gothic pile became for Alfred Lord Tennyson, Victorian England’s favourite celebrity Poet Laureate. At Farringford, Alfred and his ailing wife Emma could put up the shutters on the clamorous outside world. They entertained a selection of the great and good; they dressed their beloved sons Hallam and Lionel in lace collars and long hair, and didn’t care if the boys would rather play the bugle or ride their rocking horse than do maths. Tennyson was a genial man, not at all inclined to stand on ceremony. Above all, Tennyson in his great cloak and wideawake hat was a Poet, a very visible one. 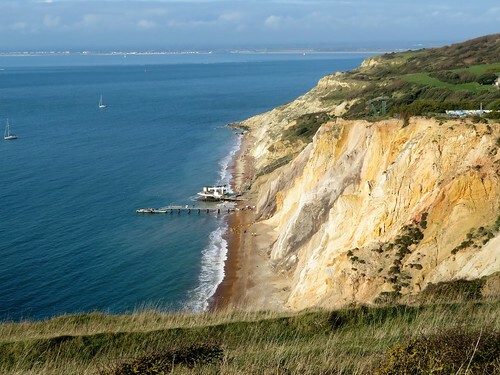 He came to the Isle of Wight to escape his celebrity, but became the island’s most famous figure, striding the long down beyond Farringford and mouthing half-created lines to the four winds at the edge of the great chalk cliffs. 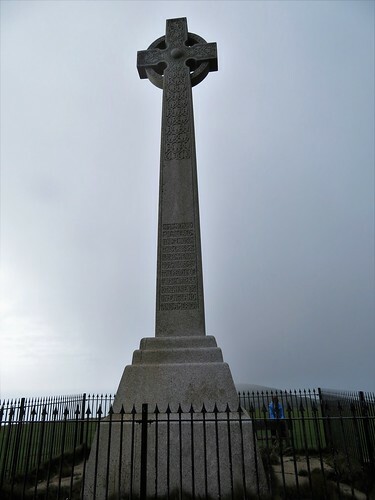 Up on the back of Tennyson Down I strode, too, heading west past the big Celtic cross memorial to the poet, out to where the down narrows to a precarious blade of chalk. 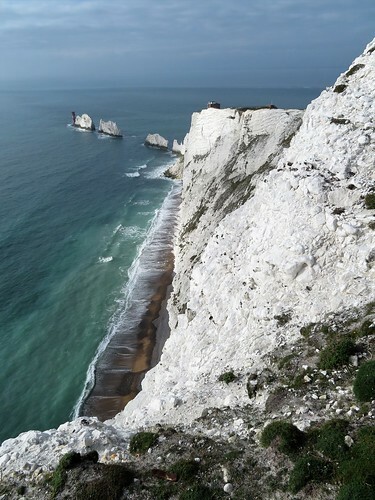 A fenced eyrie overlooks a most tremendous view, a flint-scored wall of chalk nearly 400 feet high, the waves mumbling its feet, running out to where the three white blades of The Needles rise from the water. A salt-stained striped lighthouse clings to the outermost stack, and gulls wheel far below. In Tennyson’s time they built a battery out here to ward off the threat of a French invasion. A century later, scientists and engineers used the promontory as a test ground for Black Knight and Black Arrow, rockets that tried and failed to make Britain a credible player in the Great Space Race. 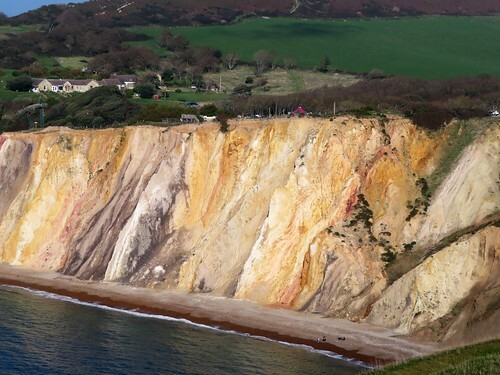 Afternoon sun struck glowing colours – rose, peach, white, crimson and dove grey – out of the deeply fissured cliffs of Alum Bay. 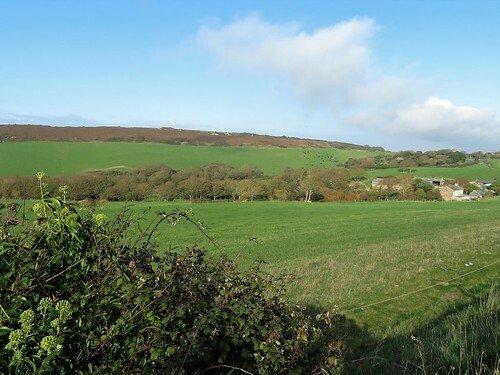 Beyond them I followed a field path back towards Farringford, glancing every now and then up at the skyline for a glimpse of a genial ghost in flowing cloak and broad-brimmed hat, still striding and declaiming to the winds. Getting there: Red Funnel ferries (redfunnel.co.uk), Southampton-East Cowes. Bus 5 (East Cowes-Newport), 7 (Newport-Alum Bay). Road – A3021, A3054 to Newport; B3401 Carisbrooke and Freshwater Bay. 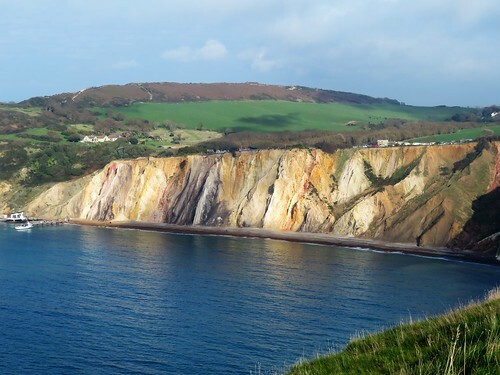 Follow ‘Needles, Alum Bay’; in 1¾ miles, left beside Highdown Inn to car park. 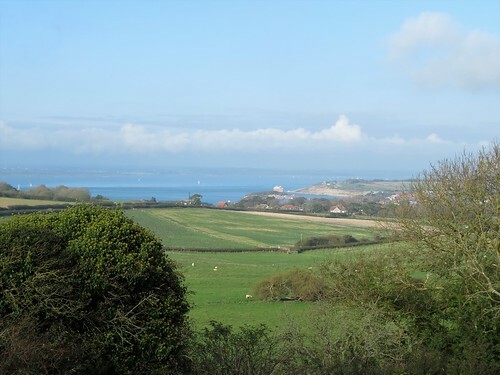 Walk (6½ miles; moderate, one short steep climb; OS Explorer OL29): From car park, east along foot of Tennyson Down. In 650m pass gate/path on left (331857) and leave trees. In another 150m, with chalk pit on right and drinking trough on left, path forks right (333858), but bear left and continue on path along lower hedge. 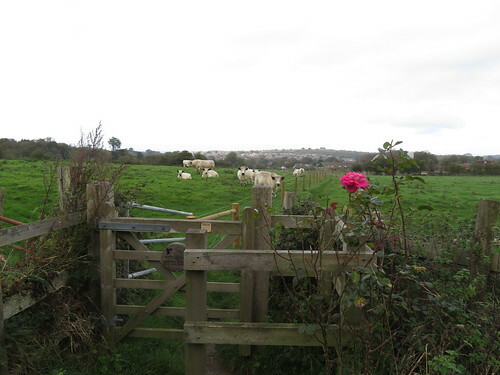 Through gate; in 100m, left on fenced path. 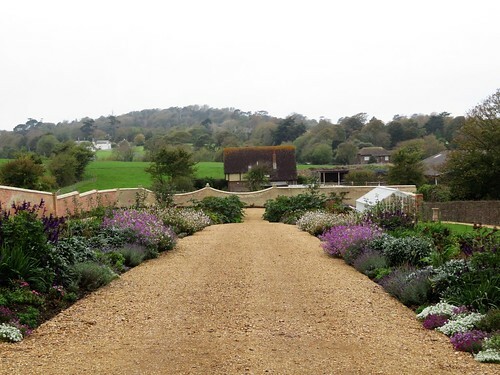 At 3-finger post (334861), right towards Farringford House and walled garden. Ahead up Gate Lane (fingerpost). In 200m, at ‘Private’ garden door on left, turn right (338861) down Green Lane. In 300m through gate (337857); cross path; straight ahead, steeply up through trees. 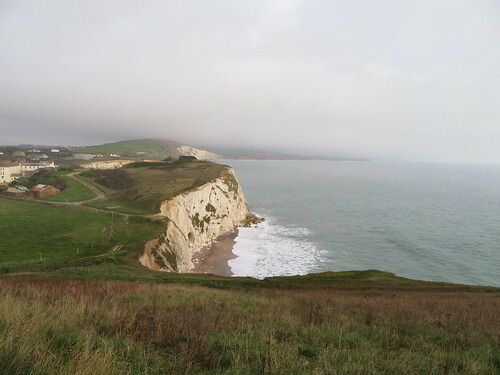 Cross summit of down to Tennyson Trail (337855); right (west) for 2½ miles to coastguard cottages (301848), Needles viewpoint (298847) and Old Battery (296849). Back along lower roadway. In ¾ mile, at left bend to Alum Bay, keep ahead (308852, ‘Tennyson Down’) on field path. In ¾ mile at Nodes Beacon cresset (319853), fork left for 600m to car park.